Series:Avant-Garde Critical Studies, Volume: 35 Editors: Harri Veivo, Petra James and Dorota Walczak-Delanois Beat Literature in Europe offers twelve in-depth analyses of how European authors and intellectuals on both sides of the Iron Curtain read, translated and appropriated American Beat literature. The chapters combine textual analysis with discussions on the role Beat had in popular music, art, and different subcultures. 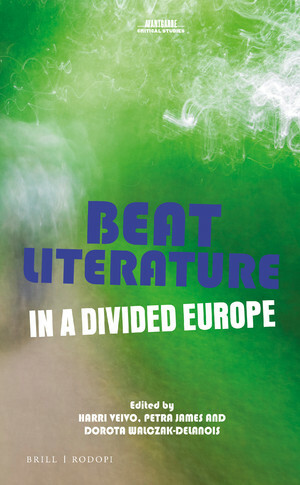 The book participates in the transnational turn that has gained in importance during the past years in literary studies, looking at transatlantic connections through the eyes of European authors, artists and intellectuals, and showing how Beat became a cluster of texts, images, and discussions with global scope. At the same time, it provides vivid examples of how national literary fields in Europe evolved during the cold war era. Contributors are: Thomas Antonic, Franca Bellarsi, Frida Forsgren, Santiago Rodriguez Guerrero-Strachan, József Havasréti, Tiit Hennoste, Benedikt Hjartarson, Petra James, Nuno Neves, Maria Nikopoulou, Harri Veivo, Dorota Walczak-Delanois, Gregory Watson.